State bank of India SBI, now going to conduct an online examination for the recruitment of Bank PO for associate bank. 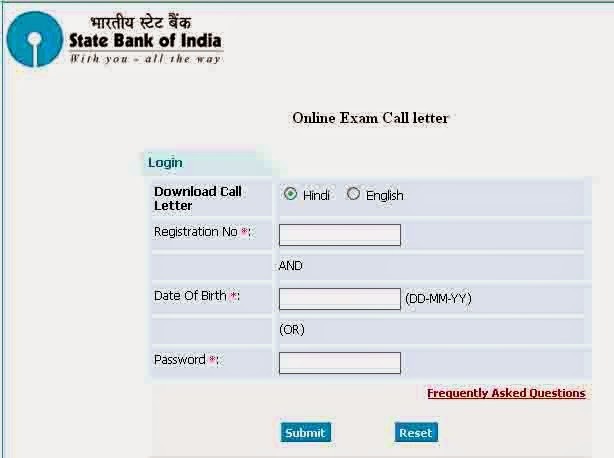 SBI Associate Bank PO Online Examination likely to be start from 9 November 2014. all candidates who filled application form for Bank PO , posts are informed that that SBI now hosted the official Admit card / call Letter for bank post . candidates have option to download admit card / call leer/ hall ticket via entering there registration No , Date of birth or password details. SBH, SBM, SBP, and SBT . posts 424 backlog of SBBJ, SBH, ,SBM ,SBP and SBT for SC, ST , OBC category will be also filed through this vacancy . Selection of the eligible candidates will be strictly based on through the online preparation examination mains examination and personal interview test. The Objective Test will be online. Immediately after the online Objective Test, Descriptive Test will be administered. Questions relating to Descriptive Test will be available on computer (Online) and candidates will have to write the answers on the answer sheet (Offline) provided to them on Paper/Pen mode.